Resin Bound Surfacing | Need To Know | Don't Get Ripped Off! With the rise in popularity of Resin Bound surfacing comes an increase in cowboy builders! Here are a few tips on what to ask your contractor before you agree to installation. The importance of UV Stability is often overlooked in Resin Bound surfacing. There are two types of Resin Bound resin in the market; UV Stable resin, and Non-UV stable resin also known as MDI. Here at Resin Bonded Ltd all of our BoundWorx® resin is UV Stable. If you do not use a UV Stable resin then your surface will turn a deep yellow-brown colour. Patches will also appear where items like plant pots have been left out and in shaded areas. Do not let the contractor convince you otherwise, the discolouration WILL be obvious within a matter of weeks even if you choose a dark coloured stone. 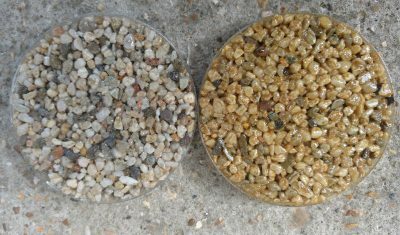 Ask your contractor to include either a clear sand or glass grit within the Resin Bound surfacing. Do not worry, the inclusion of sand or glass within the mix does not affect the colour of the overall finish. If they lay a mix of straight aggregate and resin, without the aid of anti-slip sand or glass grit, then the surface will be extremely slippy when wet. For areas that require extra traction you can sprinkle a fine glass grit into the surface after installation while the resin is curing. This should not, however, substitute the use of anti-slip products in the mix itself as the top layer of glass grit will wear away over time. You should always obtain a written guarantee from any contractor doing works for you. Contractors using high quality products and correct installation methods for Resin Bound surfacing will have no problem providing you with this. If you’re unsure about the reputability of a tradesman there are many websites such as trustatrader and checkatrade that vet and monitor high quality contractors. Failing that, we have a network of contractors nationwide who we have trained and monitored ourselves. Give us a call or fill out an enquiry form today for the details of a trained installer near you. This is especially important if you are overlaying an existing surface. The base under the resin MUST be solid with no structural movement, and strong enough to take the anticipated loading. 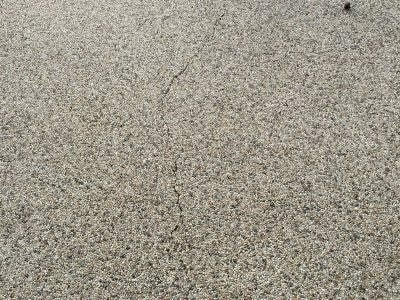 Any sinking or cracking in the base will be reflected in the Resin Bound surfacing. If you’re unsure about the stability of your existing surface, consult your contractor or an engineer. The base must also have appropriate drainage so that the water has somewhere to go beneath the resin layer. We recommend Open Graded Tarmac as the ideal permeable base, or concrete laid to falls with suitable drainage channels. We would not recommend laying Resin Bound surfacing straight over compacted MOT as it will not provide enough stability. Ok, so you’ve checked the UV stability and anti-slip properties of the materials, and you’ve made sure that the contractor offers a guarantee and is laying over a strong base. The last thing you need to be aware of is the weather. The materials MUST be installed on a dry day, if any rain or moisture gets into the resin before it has cured then you will start to see white patches blooming and the system will fail. If it rains the night before installation is due to take place, the contractor will need to make sure the base has been dried off with a blow torch. 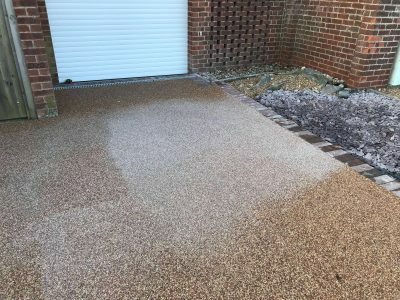 This is also a reason why Resin Bound surfacing cannot be done using existing aggregates; any moisture or contamination from the existing stones will enter the resin and cause it to fail. All of the aggregates that we supply to go with our resins have been professionally washed and kiln dried. Unsure who the right Resin Bound surfacing contractor is for you? Don’t get ripped off, contact us today and we can give you the details of an installer who works in your area and has been trained by us.